What was it like to work on such a blockbuster movie set such as Transformers? The whole experience felt like a dream. My entire family was invited to come along for the ride. We were greeted by a limo car service and then housed in a 5 star hotel. I was treated like a prince and it was more then I could have wished for. Once on-set everyone was so kind and things surprisingly worked out smoothly. The size of the crew was definitely intimidating at first, but when I became my character and the cameras began to roll, they seemed transparent. The adrenaline when Michael Bay said “action” was a feeling I’ll remember for always. Spending time on such a huge set really opened my eyes to what show business really consists of, loooooong days and pots of coffee! 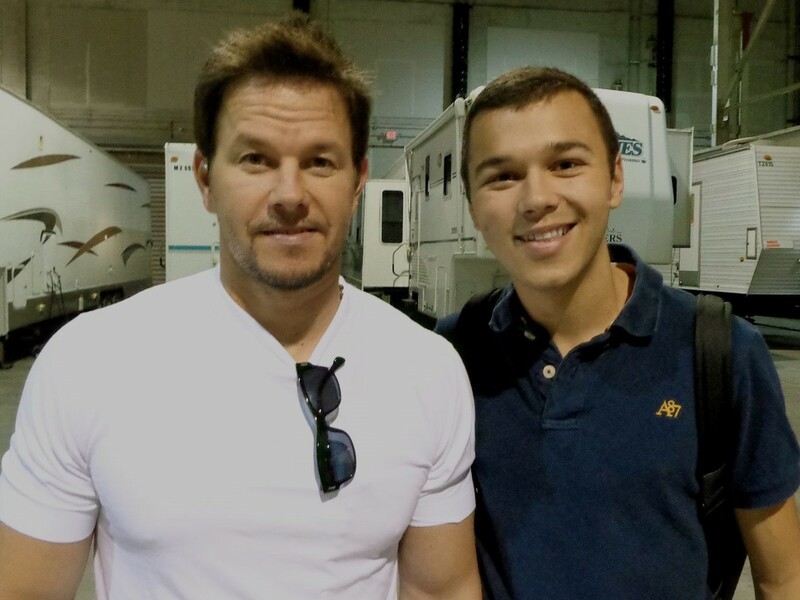 What was it like working with Michael Bay and Mark Wahlberg? Both these guys blew my mind. What I found crazy was how passionate Michael Bay was about every shot. His energy was what kept the ball rolling. Mark on the other hand, was really helpful. Just watching him listen to Michael and applying his guidelines instantly, was crazy. I asked Mark “what’s the secret to having arms like yours?” and the next day he brought me a tub of Marked Protein. He then told me, work out and add strawberries, a banana, and the last ingredient was a secret I promised to keep! What was the secret – surely you can tell? Ha! Nope – and to be honest, I haven’t been applying it well! So what have you taken away from this whole studio experience? This experience made me realize how bad I want to make it. I know I have a lot to learn but I love acting so much it doesn’t feel like work. Being on set with such great talent is definitely contagious and is a feeling I will achieve again. But next time, I’ll either be in a supporting role or the lead! I do, I’m filming a TV show called ‘Impostors’ in November. I’m playing the teenage version of Juan Carlos Guzman Betancourt (International Most Wanted List Criminal) it’s going to be one hell of a ride so you guys better tune in! Thank you Jonathan for chatting with us today. We wish you amazing success, and look forward to seeing more of you in the very near future. Thank you guys – I’ll stay in touch!